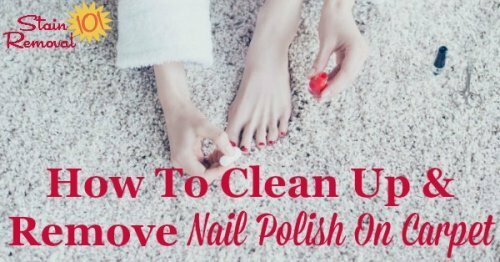 Below I’ve compiled tips and tricks for how to clean up and remove nail polish on carpet, such as when you’ve accidentally spilled or dripped some while applying it to your nails. It is never a happy moment when you spill or drip nail polish onto an area of your home, but I know there is hardly a bigger groan than when it happens on your carpeting, and unfortunately it can happen there quite easily because many of us sit on the floor to paint our nails, including our toenails, and accidents happen.Once you’ve done it once I bet you’ll never skip the little time it takes to take the precautions necessary to protect your carpet from harm when using polish again, but what about how to fix it this time? Plus, you can do a lot of harm to your carpet if you’re not careful, such as taking out the color in the carpet itself, or even harming the fibers. Therefore, I urge you to test any stain removal method you decide to use in an inconspicuous area first, to make sure the method chosen doesn’t harm your carpet. A couple more of my own tips before we get down to the suggestions and methods I’ve got listed below. Fortunately, if you’re already doing your nails you probably already have acetone or nail polish remover nearby when the accident occurs. Make sure you don’t smear or grind the nail polish deeper into the carpet fibers with your stain removal technique, so always blot gently, never scrub. Also don’t re-transfer the nail polish back onto the carpet as you remove it with a paper towel or white cloth, so frequently change to a clean spot on your blotting cloth to avoid those problems! Hint: If the nail polish remover contains you should first test it in an inconspicuous part of your carpet, to make sure the acetone does not harm or discolor your carpet fibers. Hi, I’m Taylor, a busy mom with 3 kids, so I have lots of hands on experience with house cleaning, laundry and my fair share of spots, spills and other messy catastrophes. Thanks for visiting my site. CAUTION: This website is provided for informational purposes only. It is provided as is, without warranties or guarantees. Some stains and messes just won’t come out, and are permanent. Further, some cleaning methods can harm your item, so if what you want to clean or launder is sentimental or expensive call a professional. See disclaimer of liability for more information.